Qatar Airways has the ambition to be part of TOP 3 worldwide companies and for sure, they are on the right path. It begins when you enter the First cabin and go to your seat, which is a mix between a mini-suite and a stand-alone seat. Very large space that allows you to leave a handbag, papers and a laptop even during take-off and landing. 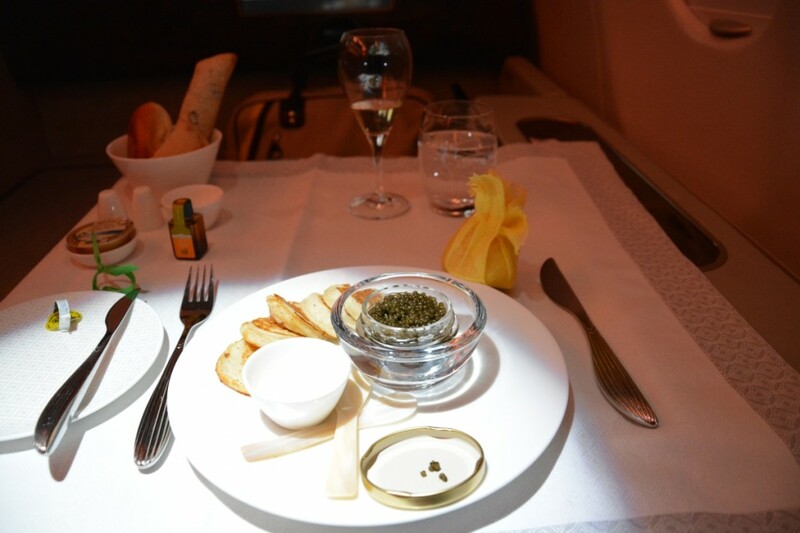 Then the in-flight catering brings you to finest restaurants level with Oscietre caviar and luxury dishes/beverages arranged on the 1 sqm table where you can organize a romantic dining, head-to-head. Finally the Qatar Airways First Class experience ends on arrival, when an individual BMW 7 limousine with chauffeur drives you from the tarmac to the QA Premium Terminal, a brand new terminal dedicated to Business and First Class travelers ; there you can access the First Class lounge, a thousands of sqm space where you can find a complimentary a-la-carte restaurant, a Spa with sauna and jacuzzi, a relaxation area and a bar with plenty of waiters. This is the unforgettable world’s five-star airline company practice. 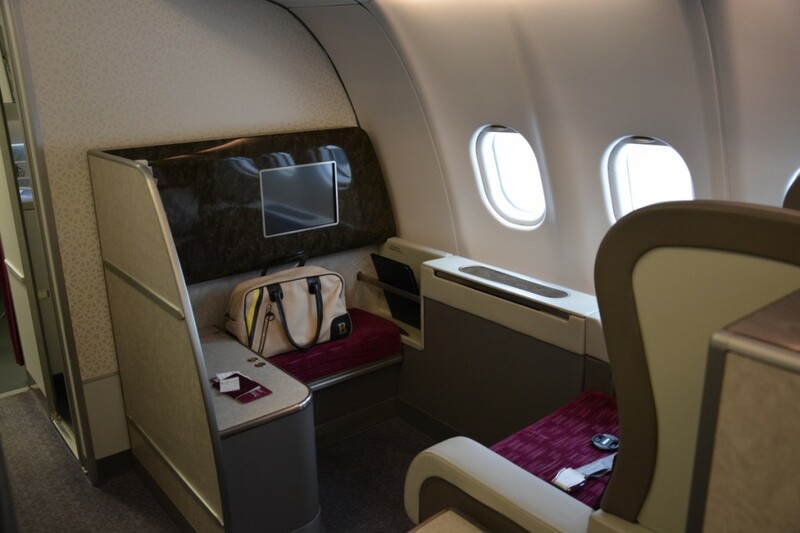 The classic 1-2-1 Qatar Airways First Class cabin configuration, even if seats are a bit old on A340, is still very nice. 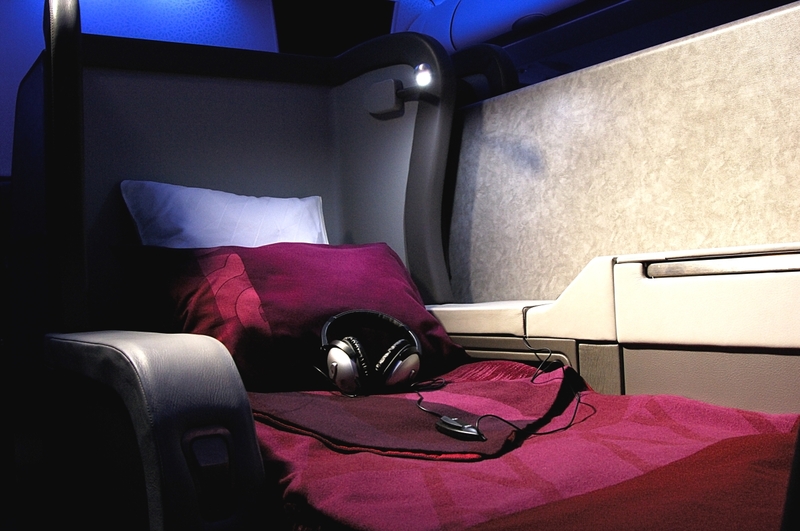 As I said in introduction, seats are a mix between a mini-suite – like Thai Airways of Emirates – and a standalone seat – like Air France – which are very large and allow a full-flat settings arranged with mattress by cabin crew when you ask them to make your bed. Pitch is also very good, you can easily eat with a friend face-to-face or enjoy alone the large table for dinner watching a recent movie. My only complain could concern the screen, which is a bit small for current First Class standards and could be itself a reason to update that old cabin. During this day flight do Doha I enjoyed one lunch and one dinner, and because I flew from Paris I could enjoy a very good catering (thanks to Servair). I enjoyed first an Oscietre caviar with homemade blinis, then a supreme of chicken with winter vegetables and finally a succulent strawberry cheesecake for lunch. Just so lush… I would also recommend the QA beverage signature, a yogurt smoothie with fresh mint: perfect to start or achieve a flight. CDG to DOH, day flight on A340 in November 2013.